One reasonable way of thinking about the most fundamental goal of international economic development is to increase the level of human happiness in all countries, and to reduce the degree of inequality of happiness within and across countries. But, as Aristotle asked several millennia ago, what is happiness? And how can we measure it, either in a given individual or in a population? Utilitarians and economists chose to avoid the problem of measuring subjective happiness, and the associated problem of comparing utilities across persons, by substituting preference satisfaction for subjective happiness. And worries about the challenges of measuring subjective happiness led philosophers like John Rawls and economists like Amartya Sen to prefer to focus on the objective prerequisites of life satisfaction — primary goods, in the case of Rawls, and capabilities and functionings, in the case of Sen.
And yet the idea of happiness, or life satisfaction, is too important to dispense with. New efforts have been made to develop survey tools and methods that permit assessment of the average level of life satisfaction for groups of people in different countries. Among others Jeffrey Sachs has played a lead role in conceptualizing and furthering this project. 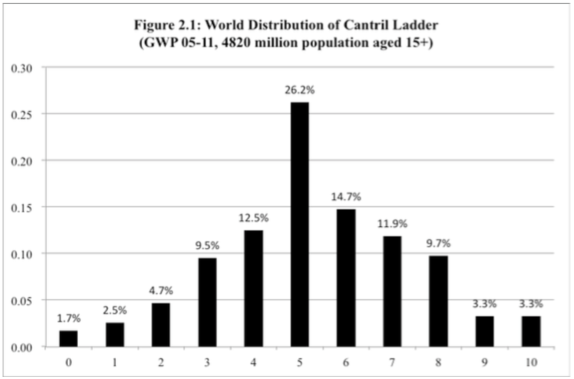 The result is a series of World Happiness Reports, beginning in 2012 (link), which can be seen as a counterpart to the World Development Reports (link) and the Human Development Reports (link). Here are some orienting thoughts from Jeffrey Sachs’s introductory essay in the 2012 report. Most people agree that societies should foster the happiness of their citizens. The U.S. Founding Fathers recognized the inalienable right to the pursuit of happiness. 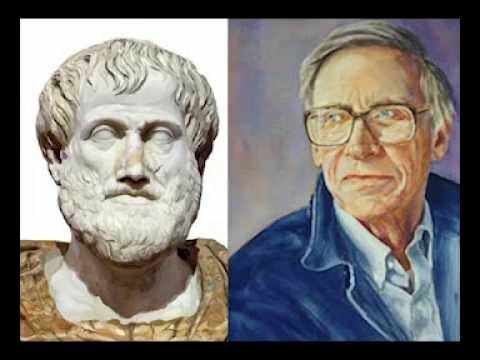 British philosophers talked about the greatest good for the greatest number. Bhutan has famously adopted the goal of Gross National Happiness (GNH) rather than Gross National Product. China champions a harmonious society. Yet most people probably believe that happiness is in the eye of the beholder, an individual’s choice, some- thing to be pursued individually rather than as a matter of national policy. Happiness seems far too subjective, too vague, to serve as a touchstone for a nation’s goals, much less its policy content. That indeed has been the traditional view. Yet the evidence is changing this view rapidly. A generation of studies by psychologists, economists, pollsters, sociologists, and others has shown that happiness, though indeed a subjective experience, can be objectively measured, assessed, correlated with observable brain functions, and related to the characteristics of an individual and the society. Asking people whether they are happy, or satisfied with their lives, offers important information about the society. It can signal underlying crises or hidden strengths. It can suggest the need for change. Sachs reports that the research team preparing the ground for a World Happiness Report finds that life satisfaction is affected by a number of intangibles — for example, “community trust, mental and physical health, and the quality of governance and rule of law” (7). The contributors emphasize that GNP per capita is a component, but not the most important component, of variations in life satisfaction across countries and regions. What has always been challenging in prior discussions of promoting happiness is the problem of measurement. How do we assess an individual’s level of happiness or satisfaction? And how do we assess the level of these goods for a population or group? The second large task, once the measurement problem has been addressed, is to uncover the social factors that account for variations in satisfaction and happiness levels. This problem is a more familiar one, since it can be treated using epidemiological and statistical tools to identify the factors most strongly correlated with positive or negative variations in satisfaction levels. The World Happiness project relies on value-survey instruments to measure population life satisfaction. Existing surveys include the Gallup World Poll, the World Values Survey, and the European Social Survey and European Values Survey. 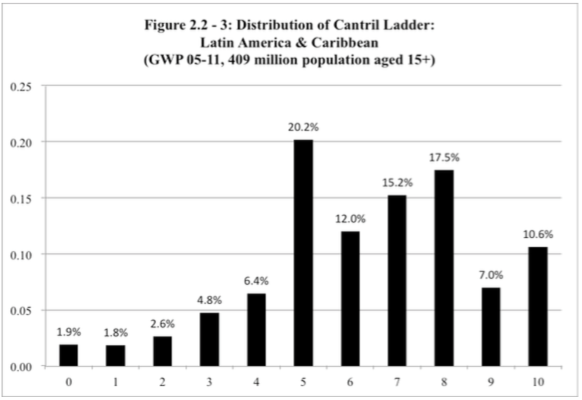 The primary instrument used in the 2012 report is the Gallup World Poll (GWP). 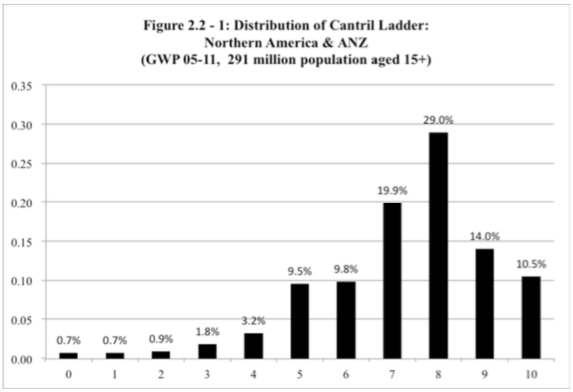 GWP uses a 0-10 scale and asks adults to place their current quality of life on this scale (the Cantril ladder). As the researchers recognize, there is a serious question here of how to calibrate and interpret the responses offered by thousands of Brazilians, Finns, and Thais for this question. What justifies us in thinking that a respondents’ ratings of 5 in Brazil and Thailand mean that Brazilians and Thais are about equally happy? Similarly, what justifies us in thinking that a 0 (“worst possible life I can imagine”) means the same in the two countries? Hypothetically, if a Brazilian can imagine a quality of life that includes arbitrary incarceration and torture, whereas a Canadian cannot, doesn’t this imply that the Canadian’s score of 5 reflects a higher level of absolute life satisfaction than the Brazilian? Intuitively it seems that possibilities like these (cultural or circumstantial differences in worst and best life circumstances in different countries) imply that cross-national comparisons of satisfaction levels based on this kind of survey are suspect. Helliwell and Wang also address the questions of reliability (consistency across measurements of the same variable at different times) and validity (accurate correspondence to the unobservable variable under scrutiny). Their strongest case for the validity of these survey-based attempts at measurement of satisfaction is the fact that it is possible to demonstrate that variations in life satisfaction measures are largely correlated with a small number of factors that are plausibly relevant to the creation of life satisfaction. Perhaps more credible than international comparisons are within-country comparisons of satisfaction levels. We might feel more confident in thinking that Canadians share a conceptual space of worst and best outcomes with each other, and this shared framework means that their assessments of their personal situations along the Cantrel ladder will be comparable. But even here, it seems likely that there are cultural and circumstantial differences within a country that might lead to the same kinds of inconsistencies. Are Brazilian favela dwellers likely to identify the same worst and best outcomes as residents of the elite neighborhood of Botafogo? Helliwell and Wang make a brief reply to this kind of concern (19), but more needs to be said. They find that these factors serve to explain a substantial amount of the variation in life satisfaction in different groups. Here is a sample regression table based on data from three different surveys. 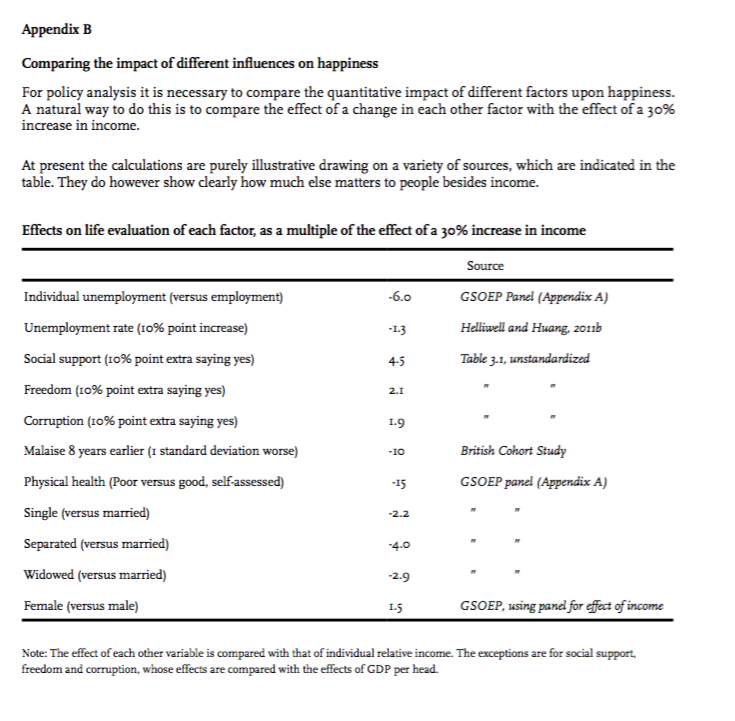 And here is their effort to recast most of these factors in a comparative analysis, estimating the effect of a given factor as a multiple of a 30% increase in income. 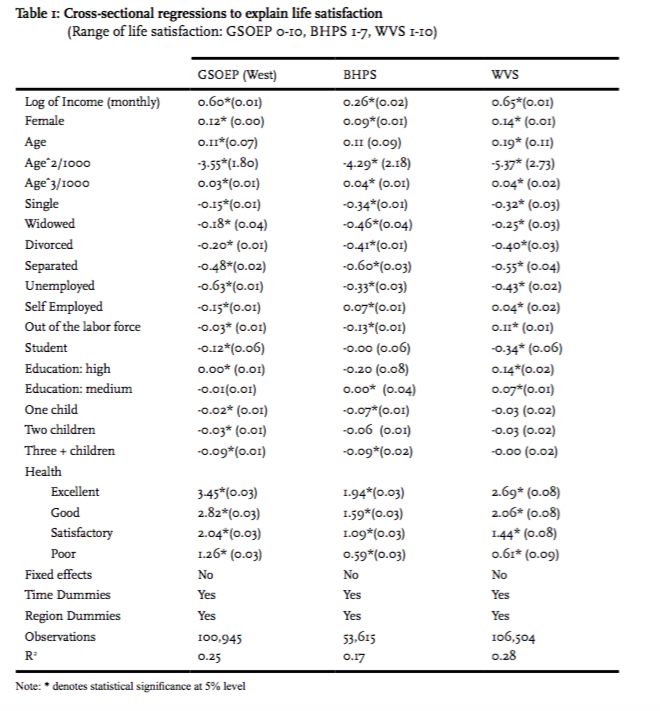 The largest positive effect identified here on life satisfaction is an increase in social support; whereas the largest negative effects are becoming unemployed and becoming separated in a marriage. This approach to economic development assessment seems important for the outcomes it wants to be able to measure and assess. It is certainly true that average income is a poor measure (to say the least) of the wellbeing of a population. So it is worth exploring other approaches that attempt to get at wellbeing in a more direct way. It remains to be seen, however, whether survey research based on questions about levels of happiness or life satisfaction can do the job. There are certainly interesting statistics coming out of this research pertaining to the level of importance of various factors in causing a higher or lower level of reported satisfaction in a group. But whether the conceptual problems of interpretation mentioned above can be solved is still uncertain. This comes down to the familiar question of validity of the measurement instrument; but in order to assess validity, we need to have better answers to the original question — what is life satisfaction? And can it be defined in a way that makes sense across persons or groups?